Since these have been one of my favourite and most popular pair of shoes this year,I thought it was only fair to dedicate an entire post to them! I’ve worn these shoes six times on my blog and probably about a million times in total so it’s about time they become the subject of a remix post. I even wore them to work today. My sister bought me these shoes last Christmas. Last year I admired, and often borrowed, a pair of my sister’s yellow heels so she bought me my very own pair. It was so thoughtful and exciting. They add so much to a look; they have such a summery feel and really make the colours to an outfit pop. I adore pairing them with yellow accessories such as my hair flower and clutch bag. I like to highlight the yellow in my dresses and cardigans. I’d wear these with almost any of my outfit. There isn’t much more to say about my shoes other than I LOVE them and they are perfect. I can see why you love those shoes so much… they're simply striking! I just adore the toe cap and the bright color. I thinking it's pretty darn amazing that you're able to wear them in so many different ways–they don't seem like they'd be super versatile, but you propved us wrong! Have a wonderful week, my sweet friend! I am in love with yellow at the moment so these shoes to me are perfection! great! 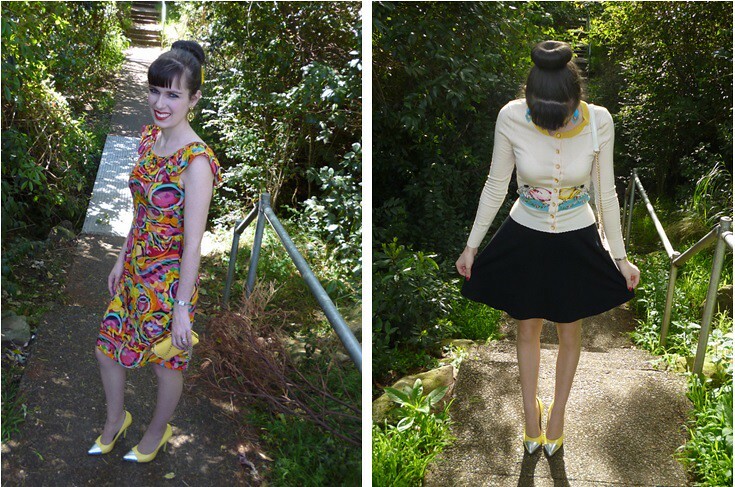 love how you pull together this many outfits with yellow shoes, I've got ones too but I haven't used them that much! My favorite is the last one, it's amazing how yellos stands up with light blue, cute! Cute shoes! Love the versatility with which you style them! L-O-V-E every outfit! You look SO cute and the shoes are awesome! I always swoon over these yellow heels everytime I see them. They always look so amazing. The shoes are so pretty! I can definitely see why you like them so much. The yellow is so pretty! so adorable!! i totally adore the flouncy skirts/bottoms on you!! those shoes are too cute! you wore it great! They are lovely shoes, it's good to see you get so much wear out of them! 🙂 The yellow colour is so cheerful too. i fall in love for the fourth! Your outfits are so well put together! And those yellow heel are awesome of course. I love your bun too, it's so perfect! That outfit with the yellow cardi is definitely my favorite! I love all these outfits <3 magic ! These shoes are truly fantastic and I love to see all the ways you have remixed them! Love the baby blue and the yellow together! Those shoes are really fabulous and so are the outfits you've styled them with. Love love love your yellow shoes!! I wish yellow looked better on me but it looks amazing on you! You have such a fun, colorful wardrobe 😀 I love it! They are so much fun! A great vibrant color AND metallic…perfect! amazing look with the same clothing! love how colorful your style is! Loving the remix, all great looks. 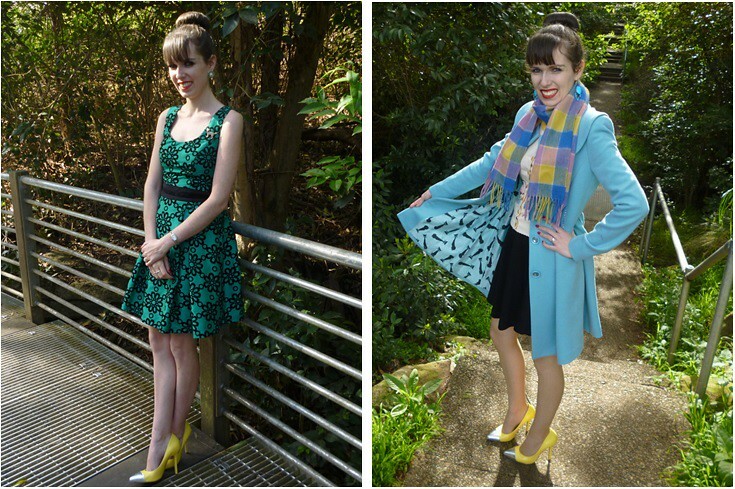 Those shoes are so you, and they're so versatile:) Love all the outfits you wore with them, Imogen. 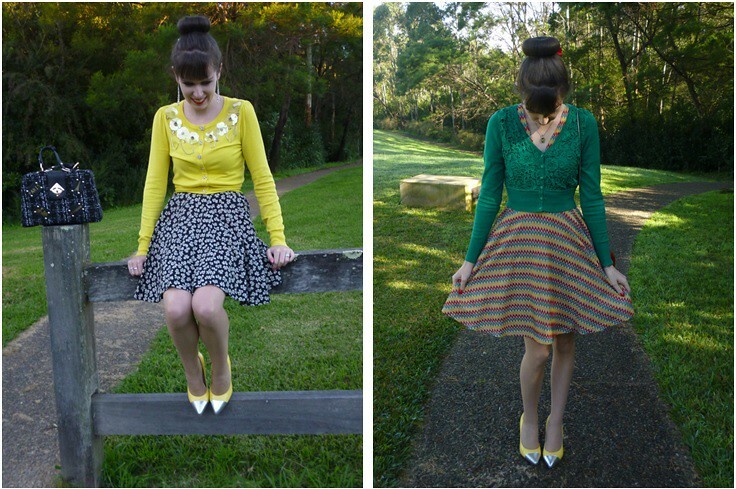 Love how you showed off the versatility of these amazing shoes, what a pretty pair!